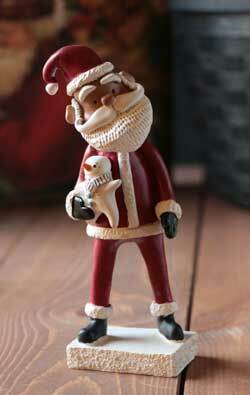 Santa with Snowman Figure, by Enesco / Department 56. A Janelle Berryman design, part of her 2013 Pumpkinseeds Holiday Collection. Measures approx 6.9in H x 2.27in W x 2.76in L. Made of resin. Other items in collection also available! Silver Ornament Holder, by Enesco/Department 56. 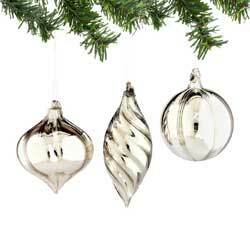 The simple design of this silver ornament displayer is perfect for displaying a special ornament that you want to highlight on a shelf. It is nice and tall, so it will hold either a small or a fairly large ornament. Stands 15 inches tall. Made of metal. 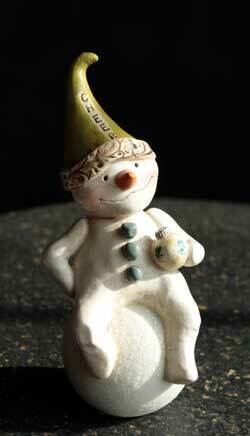 Snowman on Snowball Figure, by Enesco / Department 56. A Janelle Berryman design, part of her 2013 Pumpkinseeds Holiday Collection. Measures approx 5.79in H x 3.03in W x 2.64in L inches. Made of resin. Other items in collection also available! Solid 1956 Glass Ornament, by Department 56/Enesco. Beautiful, heavy solid blown glass ornament. This is for the SILVER ornament. Sold individually - Choose the Left, Middle, or Right shaped ornament. Part of the A 1956 Christmas Collection. Measures 4.5in H x 2.25in W x 4.25in L. Made of glass. 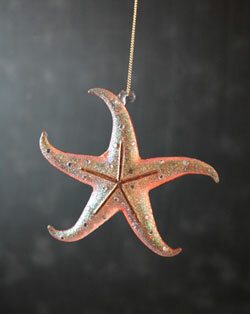 Coral Sand Starfish Ornament, by Enesco. Glitter and tiny gems this glass starfish ornament. This one is a peachy coral pink. Measures 4.5in H x 1in W x 4in L. Made of Glass, Glitter, Gold 14kt, Rope. 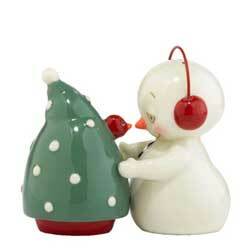 Surprise in a Tree Salt/Pepper, by Enesco/Department 56. Part of the Snowpinions Collection. Measures 3.15in H x 1.85in W x 3.54in L. Made of porcelain, with magnets. 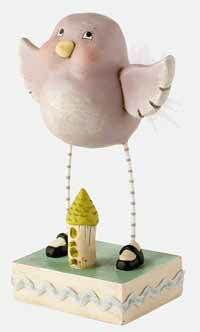 Sweet Treats Bird Birthday BoyFigurine, a Janelle Berryman design, part of her Pumkinseeds Originals line. Reproductions from Janelle's original paperclay creations, these wonderful figurines have truly unique character. You can see the quality in the whimsical forms, detailed painting and antiquing. 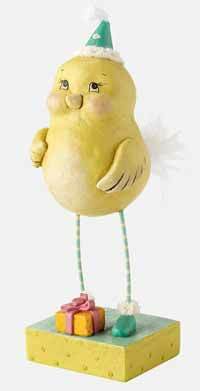 This is for her Birthday Boy Bird. Despite the name, the tiny hat and small wrapped gift is adorable enough for any celebration! (Note: this is a retired design, quantities are limited). Stands 5.75 inches tall. 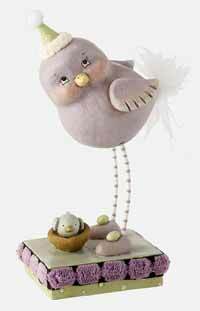 Sweet Treats Bird New Home Figurine, a Janelle Berryman design, part of her Pumkinseeds Originals line. Reproductions from Janelle's original paperclay creations, these wonderful figurines have truly unique character. You can see the quality in the whimsical forms, detailed painting and antiquing. This is for her New Home Bird. Sweet lilac-colored chick with a tiny birdhouse! (Note: this is a retired design, quantities are limited). Stands 5.75 inches tall. Turquoise Jeweled Crab Ornament, by Enesco. 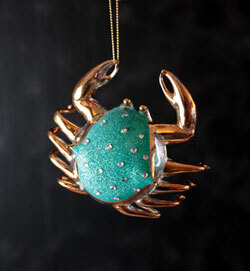 Turquoise glitter and tiny gems adorn the back of this gold claw glass crab ornament. Measures 4 x 1.5 x 4 inches. Made of Glass, Glitter, Gold 14kt, Rope. 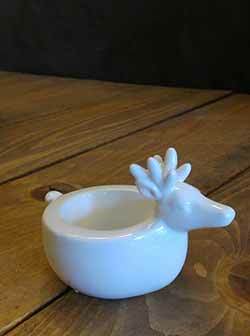 White Deer Candle Holder, by Department 56/Enesco. Measures 2.64in H x 2.56in W x 4.02in L. Made of dolomite pottery. Other White Deer items also available!